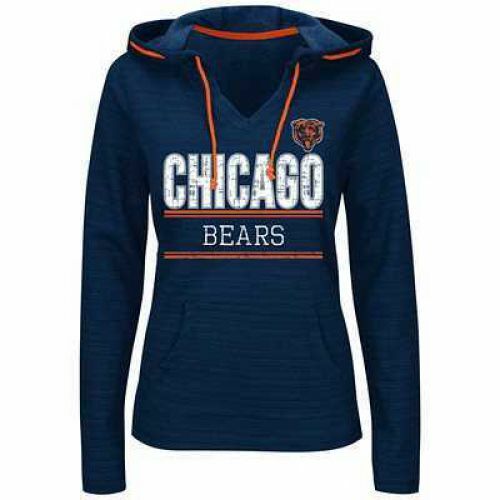 Chicago Bears women's plus navy Swift Play v-neck hoodie by Majestic has hood with orange rope drawcords, high-hem, front handwarmenr pocket and Chicago Bears with the Bears logo in weathered and foil printed graphics screen printed on the front. Available in women's plus size 1X. (HERSWIFTDBE) Majestic Women's Plus is generously sized for full figure women. 60% Cotton/40% polyester. Service Area: Shawano, Oshkosh, Appleton, Green Bay, De Pere, Menasha, Kaukauna, New London, Antigo, Plover, Hortonville and surrounding communities.